While excavating Sarvestan Palace, one of the most magnificent monuments of the Sassanid era (226-651), Iranian archeologists have unearthed a vast archeological site south of Iran, Iranian Cultural Heritage News Agency reported. Housing Iran's oldest brick cupola, the palace was built during the reign of Bahram "Gur" (The Zebra-Hunter, 420-438 A.D.) as a leisure mansion. Mehrnevsi, his well-known minister ordered the construction of this palace. It has one entrance corridor (ivan) and the dome is located in the center of the building. The new discovery has revealed that the area was inhabited since 6,000 years ago, 4,500 years older than previous estimates, said Amir Pirooz Daghooghi, project manager. "We have unearthed earthenware vessels in the site, clearly indicating the area was inhabitable since the 4th millennium BC," he added. 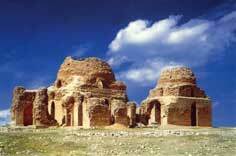 Located in Fars Province, it is made of brick, stone and plaster. Since 1956, major renovations took place. This monument has been registered on the list of National Monuments of Iran. The site was just explored prior to the 1979 Islamic Revolution, after which the work stopped.